Official artwork of Kong Kollege. —Wrinkly Kong, Donkey Kong Country 3: Dixie Kong's Double Trouble! Kong Kollege is a school run by Wrinkly Kong in Donkey Kong Country 2: Diddy's Kong Quest and Donkey Kong Land 2. In both games there is a Kong Kollege in every world of Crocodile Isle except the Lost World. Sometime between the events of Donkey Kong Country 2 and 3, Wrinkly retired from Kong Kollege to reside in her Save Cave. Like its appearance in Donkey Kong Land 2, the only purpose of Wrinkly's Save Cave is to save the game progress, this time free of charge. For the Game Boy Advance remake, the location was changed to Wrinkly's Retreat. The Kongs visit Wrinkly in Kong Kollege. Although it is not shown in-game, the main purpose of the Kong Kollege is providing education to the Kremlings. For Diddy and Dixie, Kong Kollege has a similar role to Monkey Museum (or Cranky's Hut in the remake) because they can purchase advice and gameplay hints from Wrinkly. The information is different for each world. Although most of the advice is of gameplay hints, Wrinkly also offers advice on enemies and the world boss. Kong Kollege being a private school, explains its tuition fees for gameplay advice. Although after first hearing a piece of advice, the Kongs can hear it again for free. The first and foremost option offered in every world is saving the game. For each location, saving the game for the first time is free of charge, but Wrinkly subsequently charges two Banana Bunch Coins (or one in the Japanese version) to do so again. In The Flying Krock, regardless of regional release, the first time the Kongs save their progress costs one Banana Bunch Coin. In the Game Boy Advance version, Kong Kollege went through some minor changes. Since the remake allows the player to save their game from the newly-added world map menu (by pressing ), Wrinkly no longer offers to save Diddy and Dixie's progress. The Kongs can also request to do "homework", by filling up a Scrapbook with 40 photographs hidden throughout the game. In Krazy Kremland, Gloomy Gulch, and K. Rool's Keep, she also gives advice for each of the book's pages for 10 Banana Bunch Coins apiece; she gives advice on five pages for each world. Wrinkly gives them a DK Coin for every page filled upon returning to Kong Kollege. The purchased advice can also be re-accessed from the world map menu (by pressing ). In Donkey Kong Land 2, Kong Kollege only offered the essential option of saving the Kongs' progress. This means that they are no longer able to purchase advice. The fee for saving the game remains two Banana Bunch Coins, even in the Japanese version. A handful of objects are visible in the background of Kong Kollege, specifically in Donkey Kong Country 2. 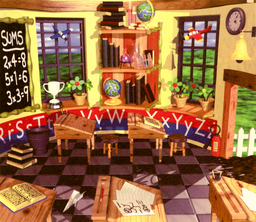 The design is much more simplistic in Donkey Kong Land 2, where half of the background had desks, a chalkboard, a bookshelf, and two windows. The official artwork makes it easier to analyze some of the background elements. In the original version, a clear, cloudy sky over a grassy field is seen from the building. In the remake, the outside display varies between each world, based on its theme. This even affects the tint of Kong Kollege. A few questions regarding the background details of Kong Kollege are asked in Swanky's Bonus Bonanza, including the globes (answer: 2), desks (answer: 5), and airplane models (answer: 2). In a Krazy Kremland challenge, he even asks who operates the Kong Kollege, which is Wrinkly. ABC's poster An ABC's poster circles the bottom wall of the Kollege. The letters of 'r' through 'z' appears at the bottom of the wall. Clock On the top-right corner is a clock, whose hands appear to read "4:05". Desk There are five wooden desks in Kong Kollege, two of which are shown with a paired wooden seat. Drawing On one of the desks is a drawing of a stick figure jumping over a car. Fire extinguisher A fire extinguisher sits right at the entrance to Kong Kollege. Globe Two globes showing a different geography than Earth. Paper airplane A paper airplane is lying on the floor. Potted flowers Three potted flowers are sitting on a windowsill. From left to right, the first one is placed right next to the silver trophy, while the other two sit on the second windowsill. Test tubes A few empty test tubes are lying on the bookshelf. Textbook Two of the desks have opened textbooks on them. Trophy A silver trophy is standing on the left windowsill. Toy plane There are toy planes hanging from the ceiling, each in front of a window. The left plane is blue and the right one is red. Trash can A trash can somewhat resembling a Steel Keg appears on the far left, next to a stack of three black books. "Since most people don't read the manual, you can get some basic game education from Wrinkly. But since it's a private school, you'll have to pay the tuition fees." 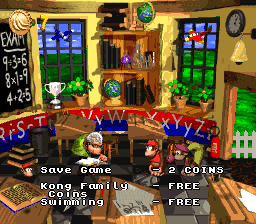 The menu of Kong Kollege in the Japanese version, which only requires one Banana Coin for subsequently saving progress. In the Game Boy Advance remake, as seen in Gangplank Galleon. Wrinkly dismisses the Kongs from Kong Kollege of the first world. In the Game Boy Advance remake, as seen in Crocodile Cauldron. In the Game Boy Advance remake, as seen in Krem Quay. In the Game Boy Advance remake, as seen in Krazy Kremland. In the Game Boy Advance remake, as seen in Gloomy Gulch. In the Game Boy Advance remake, as seen in K. Rool's Keep. In the Game Boy Advance remake, as seen in The Flying Krock. Kong Kollege is the only save point in the Donkey Kong Country trilogy to not have the word "save" in its name. The official artwork displays three different equations on the chalkboard, two of which are correctly answered. They are all multiplication equations, and the only incorrect one (5*1=6) should have an addition symbol in place of the multiplication one. This page was last edited on November 20, 2018, at 14:42.